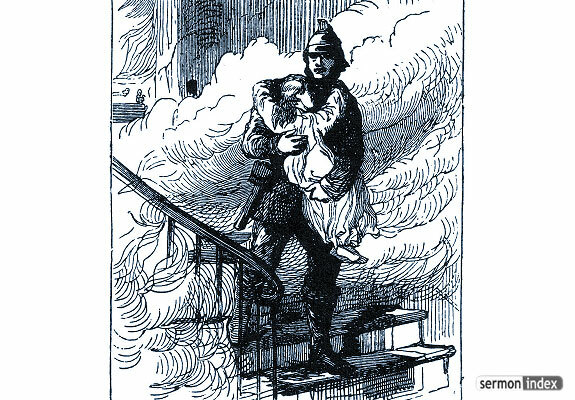 Description: The child, in danger of the fire, just clings to the fireman, and trusts to him alone. She raises no question about the strength of his limbs to carry her, or the zeal of his heart to rescue her; but she clings. The heat is terrible, the smoke is blinding, but she clings; and her deliverer quickly bears her to safety. In the same childlike confidence cling to Jesus, who can and will bear you out of danger from the flames of sin. The nature of the Lord Jesus should inspire us with the fullest confidence.